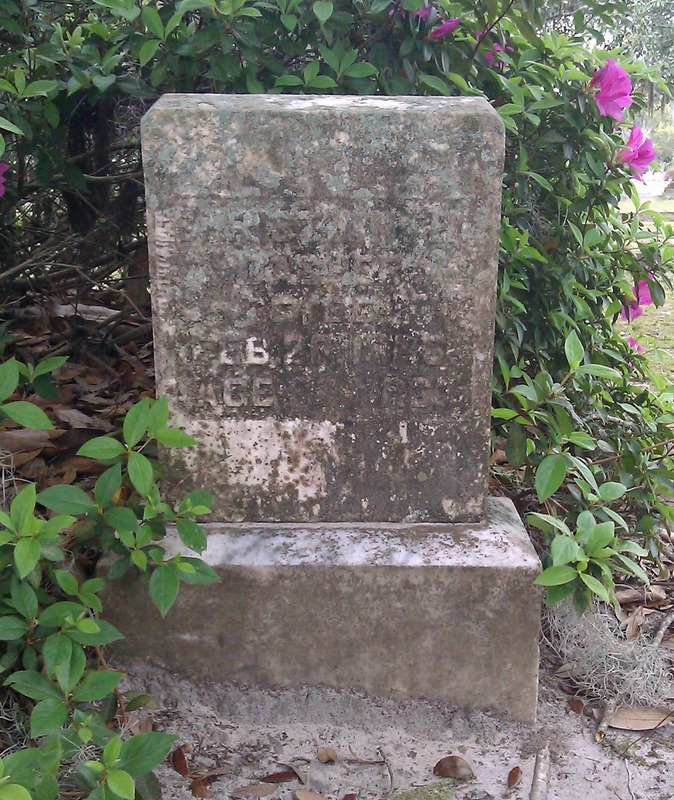 Several of my ancestors and relatives, including my dad, are buried in Sunset Hill Cemetery (established in the early 1860s) in Valdosta, Georgia. (Click on the name to go to their website.) I know where at least three family plots and a few other family burials are located, but there are some whose locations I don’t know. I was pleased to find out a few years ago that Sunset Hill Cemetery had an interactive online map that allows you to search for burials by name, military service, or year of death. I thought I’d share how I used this to find the grave of one of my ancestors. Once you get to the website, click on the link “Click here to search the Sunset Hill Interactive Web Site,” and you will be taken to the map (see below). Be sure to use ALL CAPS when you type in a name or military service. Otherwise your search won’t return anything. It took me a few tries to remember this. Above is a screen shot of the Sunset Hill Cemetery interactive map. I typed in PENDLETON and got a pop-up, scrollable list of all of the Pendletons buried in Sunset Hill Cemetery (see above). The list gives the section, block, and lot of where the burial is located, the full name of the deceased, and birth and death year. The red squares on the map show the burial locations. I scrolled through the pop-up list of Pendletons to my paternal second great grandmother Catharine Sarah Melissa Tebeau Pendleton. Hovering over her name brings up another pop-up that points to her burial (see above). I used this interactive map to look up the burial location of my paternal third great grandfather Christian Herman Dasher (1786-1866). I took a photo of the map and location info with my smart phone, hoping that having a visual would aid us in locating his grave. Then my sister Missy and I drove over to the cemetery to look for his grave. The sections are labeled with letter and number on the ground, but we had a bit of trouble figuring out which way the section numbers went (as in the “308” in Section “C308” in the above). Then we had some trouble finding his grave as it is covered in lichen or mold or whatever-it-is and is nearly illegible (see below). The cemetery office is at the cemetery, and we were about to head there for help, but we tried one more time to try to find it. Luckily, I remembered that someone had posted a photo of Christian’s headstone on findagrave.com before it became covered in mold/lichens, so I looked it up on my smart phone. We compared the findagrave photo with the headstone above, using the shape of the gravestone and the bush behind it as clues. This was it! If you look closely at the headstone, you can just make out Christian’s name. (Although, it doesn’t show up in the photo above.) His wife Elizabeth Waldhauer is buried on his left, and on his right are his brothers-in-law John C. Waldhauer (which, by the way, is spelled wrong in the database) and Israel F. Waldhauer. My sister is going to kill me, but I didn’t discover until some time later that the map is zoomable. (Sorry Missy, but didn’t you have fun traipsing around the cemetery looking for Christian Dasher?) We probably wouldn’t have had so much trouble if I’d found this out ahead of time. I could have gotten a better idea of where this grave is located by getting a better visual. The map controls are very faint on the upper left hand side until you hover over them. Who knew? I had never noticed this before. The Sunset Hill Cemetery interactive map is a great aid in finding grave locations (especially now that I know where the map controls are!). I like to let my “fingers do the walking,” as they say, before I search “on the ground.” Thank goodness for technology! Wonderful. Good to know you have a real Christian in your family! Lol Tom! :) Yep, he was born in Effingham County. He's one of the Salzburgers. I remember you and I talking about our Salzburger ancestors once upon a time. I thought we might be related somehow through them since they liked to intermarry.